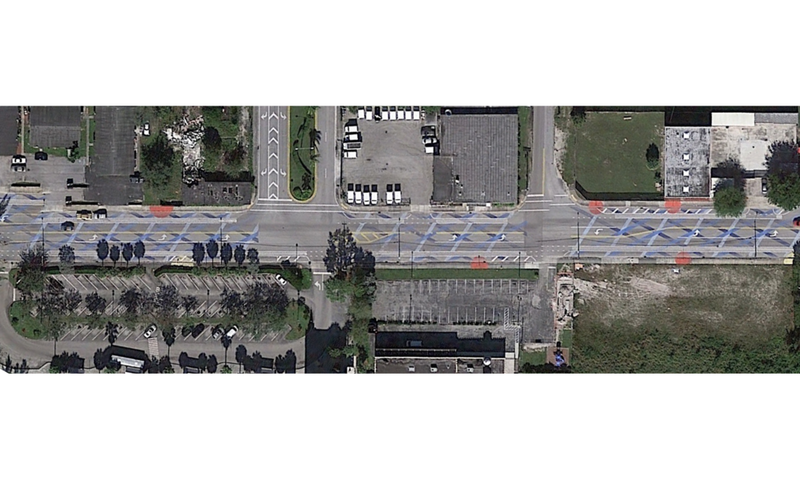 A community painting project temporarily calls out and re-interprets the streetscape. Opa Locka was, absurdly, conceived of as a Moorish town by someone who knew little of the tradition. Few inhabitants have any connection to the town’s aesthetic. Yet it is a fixture of life. Blue stripes criss-crossing the asphalt reference Moorish detailing, elevating an oddity to a badge of local pride. The color recalls the historic practice of using water for climate control, given that both heatwaves and flooding are exacerbated by the ubiquitous hardscape. Meanwhile, red and yellow dots highlight the awkward placement of contemporary infrastructure in the pedestrian right-of-way.